Summer is almost here and you know what that means: road trip! Whether you’re traveling cross-country or setting out for a destination just a few hours from home, it is important to be prepared if you plan on bringing your dog along for the ride. Although most dogs are accustomed to riding in the car for trips to the vet or the groomer, a lengthy drive is quite a different experience. To help prepare your pet for a road trip, consider bringing him or her with you on a longer-than-normal drive to a neighboring town or city. Practice taking bathroom breaks to familiarize your dog with stopping at unfamiliar locations. The more you can do to mentally prepare your pet for a road trip, the better! Take your dog to the vet to make sure he/she is up to date on all vaccines. Your vet also can give you a copy of your dog’s medical records, which you definitely should bring with you on your trip in case of emergency. If you’re worried your pet might suffer from car sickness, talk to your vet about solutions/medications you can bring with you on your trip. If you don’t already have one, get an identification tag for your dog’s collar. It should include your dog’s name, your name, your phone numbers and your home address. You also should get a current rabies tag from your vet. Purchase a first aid kit for your dog to bring along with you on your trip. 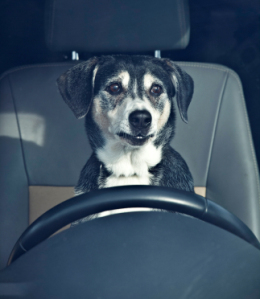 Figure out how you’re going to keep your pet safe while you’re in the car. If you have to slam on your brakes or if you’re involved in an accident, a dog can become a projectile and potentially can harm the animal and any human passengers. If your dog is crate trained, you may want to consider investing in a plastic or collapsible crate. You also may purchase a restraint harness that locks into a seatbelt receptacle. Another option is to buy a wire or mesh pet barrier for SUVs, which separates the rear cargo area from the backseat. If your pet takes any medications, make sure you have enough to last the duration of your trip. Make sure you have enough dog food to last the length of your trip. Map out rest stops on your route (plan to stop every 3 to 5 hours) and research veterinarian offices along the way. Keep the car cool and well-ventilated. Never leave your pet alone in the car during rest stops. Make sure your dog remains hydrated throughout the trip. We hope you’ll take this checklist into consideration before taking your pet on vacation. With a little planning and preparation, your summer road trip is sure to be a success!